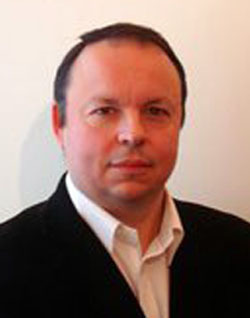 Award-winning London-based horror film historian STEPHEN JACOBS is the author of Karloff: More than a Monster. Writer STEPHEN JACOBS was recently awarded The Rondo Award for Book of the Year for “Boris Karloff: More than A Monster” – the authorised biography of the great British horror star. 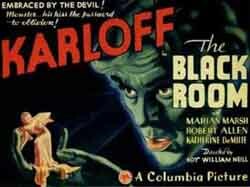 Today Stephen writes exclusively for The Spooky Isles, outling his personal Top 10 Karloff films. These may not necessarily be the best, or the most celebrated, of Boris Karloff’s films and I fully expect that some will be conspicuous by their absence. Where is Targets for example? or The Old Dark House … or Black Sabbath? Please remember, though, that these are, for one reason or another, my 10 favourite Karloff films. I don’t expect you to agree with me… but all are available on dvd so why not check them out anyway? Note: These films are listed in the order of their release, rather than in any order of preference. 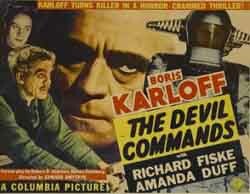 The film that brought Boris Karloff international fame, after having appeared in films for over a decade. I suspect more people know this film’s storyline than that of Mary Shelley’s 1818 novel – how Dr. Frankenstein builds a man from cadavers but due to the incompetence of his assistant, Fritz, implants a criminal brain into his creation. 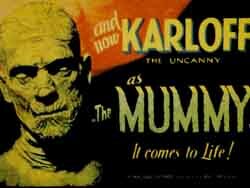 In the first, and the best, of the Universal mummy films Karloff plays Imhotep, an Egyptian priest, buried alive for daring to steal the sacred Scroll of Thoth in an attempt to resurrect his love, the deceased Princess Ankh-es-en-Amon. Centuries later Imhotep’s mummy is discovered and unwittingly revived (by reading the sacred scroll). Ten years later, the mummy – now unwrapped and known as Ardath Bey – meets Helen Grosvenor (Zita Johann) whom he believes to be the reincarnation of his long dead love. It took Jack Pierce eight hours to make Karloff up as the mummified priest and later a further 2 hours to remove the makeup, using solvents and acids. Ardath Bey took four hours to complete. The picture previewed in Hollywood on 29 November 1932. The Los Angeles Times wrote: ‘The Mummy beggars description. It is one of the most unusual talkies ever produced.’ It also has one of the best movie posters ever designed. This is a unique film, a perverse picture for mainstream Hollywood, which contains Satanism and hints of necrophilia. 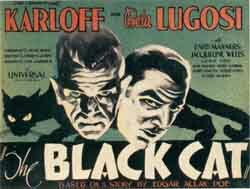 Although The Black Cat bears no relation to Edgar Allan Poe’s story of the same name, it does, however, team the star for the first time with Bela Lugosi. Karloff stars as Hjalmar Poelzig, a Satanist who lives in a home built on the ruins of Fort Marmorus, a WWI fortress overlooking the site of one of the bloodiest battlefields of the war. Dr. Verdegast [Lugosi] and honeymooning couple Peter and Joan Alison [David Manners and Jacqueline Wells] arrive at Poelzig’s expressionistic home following a bus crash. Verdegast, however, is a former acquaintance of Poelzig and accuses his host of not only betraying the fort to the Russians, but also of stealing the doctor’s wife as he languished in jail. The scene is now set for a battle of wills between the protagonists as Verdegast attempts to save Joan from the clutches of the Satanist. Filming began on the 28th March 1934 and lasted for 3 weeks. Despite the New York Times’ claim that the picture was, “more foolish than horrible,” The Black Cat became Universal’s top box office earner of 1934. It was, however, too much for the British censors. Recut to remove all traces of Satanism the picture was released in Britain as House of Doom. For many this is the best movie sequel of all time. The story begins with Mary Shelley herself [Elsa Lanchester] taking up the story where Frankenstein had ended. Henry Frankenstein [Colin Clive] is approached by Dr. Pretorius [Ernest Thesiger] and together they make a mate for the Monster. Things don’t go as planned, however, when the female creature [Lanchester, again] proves disenchanted with her intended. 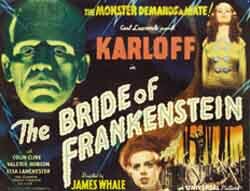 Initially James Whale had resisted making a sequel to Frankenstein but later changed his mind. Filming began in January 1935 and was completed two months later. Karloff remained disgruntled over the decision to give the Monster the ability to speak in the film. “The speech… stupid!,” he later said. “My argument was that if the Monster had any impact or charm, it was because he was inarticulate… ” Still, the monster was mute once more in the sequel Son of Frankenstein (see below). 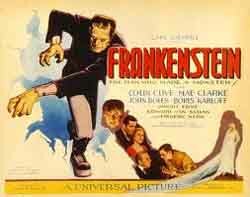 Along with Frankenstein this is one of 13 films Universal is restoring to celebrate the studio’s 100th anniversary. Let’s hope the it can turn up Bride of Frankenstein’s deleted scenes for inclusion … But don’t hold your breath. After murdering his younger sibling, the kindly Anton, the evil Gregor takes his brother’s place even affecting his brother’s paralysed arm. During the wedding ceremony to Colonel Hassell’s daughter Thea [Marian Marsh] Gregor’s cover is blown when he is attacked by Anton’s dog and uses his ‘paralysed’ arm to strike at the hound. Gregor escapes to the black room where his fate awaits him. In Warner Brothers The Walking Dead Karloff played John Elman, an ex-con framed and subsequently executed for the murder of an incorruptible judge. Brought back to life by Dr. Beaumont [Edmund Gwenn] Elman confronts those responsible for his death. The picture was directed by Michael Curtiz, who had already directed several films in the horror genre: Doctor X and Mystery of the Wax Museum, both starring Lionel Atwill and Fay Wray. This is an often unfairly maligned film. Although the young Donnie Dunagan (as Peter, the son of the Son of Frankenstein) may grate on some people, this is surely more than compensated by the ensemble of Karloff, Basil Rathbone, Lionel Atwill and Bela Lugosi. 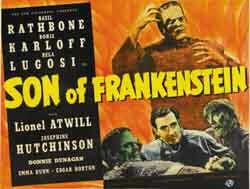 Dr. Frankenstein’s son, Wolf [Rathbone] arrives with his wife and son at his father’s castle. There he discovers the Monster in the care of the broken necked blacksmith, Ygor. Wolf naturally revives the Monster who takes revenge on those who had hanged Ygor. Meanwhile Inspector Krogh [Atwill] investigates the murders and suspects that, once again, the Monster is loose. Filming began in November 1938 and was completed on 5 January 1939, only two days before its preview. The Los Angeles Times called it “a first-class successor to the original Frankenstein.” It was Karloff’s final appearance as the Monster in a Universal picture. From now on his “best friend” (later played by Lon Chaney Jr., Bela Lugosi and Glenn Strange) would become the hulking, cumbersome creature so often imitated by children. Despite Karloff’s appearance it is Bela Lugosi who steals the show in what is surely his finest role. Still, it’s always good to see Karloff as the monster, even if he is woefully under used in this film. Another ‘mad scientist’ film – this time one in the series of pictures Karloff made for Columbia in the late 1930s/early 1940s. Karloff, as Dr. Julian Blair, develops a machine to record people’s thoughts. However, after his wife is killed in a car crash Blair uses the device in an attempt to contact his dead wife. The doctor later resorts to graverobbing to provide corpses to use in his research. The townsfolk become unhappy and, needless to say, things do not end well. 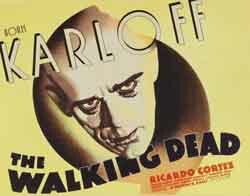 In 1944 Karloff signed with producer Val Lewton to make, initially, two films for RKO. He had already begun work on the first, Isle of the Dead, when his recurrent back problems temporarily halted the picture’s production. 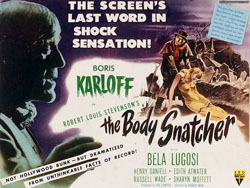 While Karloff recuperated Lewton began working on The Body Snatcher. Adapted, and expanded, from Robert Louis Stevenson’s 1881 tale of the same name this film contains, very possibly, Karloff’s greatest role – that of the grave robbing cabman Grey. Karloff was joined by Henry Daniell and, for the last time, Bela Lugosi (who was in poor health during production) in this tale of murder and body snatching in 19th Century Edinburgh. The film does indeed contain some chilling moments – the off screen murder of the street singer, the death of Joseph… and a great ending! 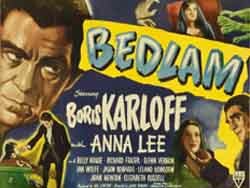 The last of the three films Karloff made under the guiding hand of Val Lewton, this is an 18th Century historical drama, concerning the mistreatment of the inmates of St. Mary’s of Bethlehem asylum (or ‘Bedlam’ as it was commonly known). Karloff plays Master George Sims, the corrupt apothecary general in charge of the asylum’s inmates. When Lord Mortimer’s protégé, Nell Bowen (Anna Lee) plans to reform St. Mary’s Sims has her committed. While there, however, she befriends the inmates who later turn against the sadistic Sims. Karloff’s fate in the film is in the best tradition of Edgar Allan Poe. Award-winning Boris Karloff historian STEPHEN JACOBS is the author of Karloff: More than a Monster. You can buy his book here from Amazon and read his interview with The Spooky Isles here. He also wrote an Spooky Isles article Karloff’s London, a location guide including Boris Karloff’s childhood homes and filming locations around the English capital . These were Stephen Jacobs favourite Boris Karloff films – but what did you think? Comment below on your own favourite flicks from the Gentleman of Horror. The Lower Quinton Witchcraft MurderWhy does Jack the Ripper still haunt Whitechapel? This is pretty much the canonic Karloff best-of list; some might add the 1935 ‘The Raven,’ which was a kind of follow-up to ‘The Black Cat’ (and which had even more censorship trouble in Britain), and which also stars Lugosi, but Karloff’s role is probably secondary to Lugosi’s in that one. There’s also 1958’s ‘The Haunted Strangler’ and ‘Corridor of Blood,’ in both of which Karloff gives remarkable later-career performances. My own personal favorites are ‘The Mummy’ and ‘Bride of Frankenstein,’ both of which are among the greatest horror films ever made. ‘The Mummy”s uncanny, dreamlike atmosphere of dread is hard to beat, and as for ‘Bride of Frankenstein’—well, what can you say about perfection? You left out, in my opinion, one of Karloff’s best ( with Lugosi), the tremendous….the Invisible Ray. I consider this easily in the top 10. I totally agree with you on Frankenstein, The Mummy, and The Black Cat. I could watch those over and over again. Bride of Frankenstein was ok and I haven’t seen the others mentioned before. I forgot to say that I’ve seen The Body Snatcher on TV a few weeks ago and really liked it.